Because they have hidden pictures that we have to discover, and they are so fun! Wallace Edwards is not a stranger in our house. Alphabeasts is much-loved and rather popular in our house, and not just with the kids. Painted Circus by Edwards is another big hit as it is full of optical illusions. I remember reading about how Edwards plays with language and art to inspire kids to think differently. Monkey Business became a favorite book where finding the monkey hidden in each page was as much fun as poring over the illustrations and figuring out the meaning of the text, not just literally. IDIOM: a group of words whose meaning cannot be understood from the meaning of the individual words; an expression, peculiar to specific language, that cannot be translated literally. Thus starts this gorgeously illustrated book full of visual pun and action. Each page presents an idiom in a simple sentence, but with rich yet comical illustrations that easily amused and entertained the resident 6-yo. "Not again", sighed Owen. "It isn't easy being a bull in a china shop." shows a well-dressed gentleman of a bull with a ring at the end of his nose, one shoe untied, his cane and horns hooked into assorted urns and vases on the shelves, his hand stuck in a rather ornate jug, all entangled without intention. Phil had no formal musical training, so he learned to play by ear. shows a droopy-eared long-faced dog, Phil, sitting on the sidewalk with two bones in his tip jar, playing a violin with his two long ears while two little mice sit in rapt attention cheering him, presumably. I better leave the rest for the readers to experience first-hand. The book gave me the opportunity to introduce these idioms and phrases to the 6 yo, explain the meaning easily, and let her connect the dots. Incidentally, Ana's first encounter with metaphors and phrases which don't mean much if we add up the meaning of the individual words themselves but have become part of our speech by what they convey in toto, was through the book Butterflies in my Stomach and Other School Hazards by Serge Bloch. "I have butterflies in my stomach", "I don't want to open that can of worms" and such might not mean much initially, but, with the stark yet comical pen-and-ink drawings Bloch has brought out the literal meaning of the words along with the emotions they convey. 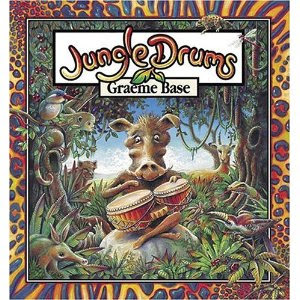 Moving on, Jungle Drums by Graeme Base came into our lives after our fascination with Water Hole. By now, children around the world are probably familiar with the Swahili words for the animals of the savanna - Simba (Lion), Punda Milia (Striped Donkey aka Zebra), Kifuru (Rhino), Chui (Leopard) and Tembo (Elephant). Jungle Drums is about a tiny warthog (Ngiri) who gets teased all the time and wants it to stop. Nyumbu (Wildebeest) gives him a set of magical bongos telling him that it will make his wishes come true. "Just remember, wishes can come true, but not always as you expect. ", she says with a twinkle in her eye. The unexpected happenings make up the rest of the book, until things get back to normal and Ngiri is not teased anymore. Each page has Nyumbu hidden in the picture. Spotting her is the extra challenge in this book. I admit, I failed miserably. A wisp of a ghost-like projection somewhere in the far horizon, a suggestion of a face hidden among the bushes... it takes a keen eye to spot the wildebeest in each page. Ana found them all, rather rubbing it in my face, inviting me to spot them with her and saying helpful things like, "Oh this one jumps out at you, it is too easy Mama, come on don't take so long!" The illustrations certainly have the Graeme Base touch, colorful, lush, imaginative. Ana's favorite (and mine) was the page where the Other Animals lose their stunning spots and striking stripes, impressive horns and curly trunks but the warthogs acquire them. 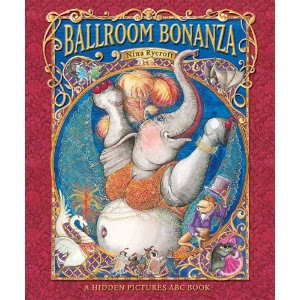 Ballroom Bonanaza by Nina Rycroft is a random pick from the library and it turned out to be an instant hit. Who will win the prize this year? Thus starts this book that runs from A to Z showcasing affluent alpacas, bears in boleros all the way to zebras who can dance the zapateado. Of course, as with all abecedary books, I am curious about what represents u, w, x and the book had a clever solution. The front and back inside covers show pictures of 26 instruments like kettledrum, guiro, castanets along with bassoon, cello, violin, saxophone and such, each of which is hidden in the pictures on the pages of the book. The challenge is to spot the instrument that completely blends with the action and props in the picture on every page. In addition, most letters introduce a dance form: camels doing the conga, donkeys demonstrating the disco, elephants belly-dancing, flamingos dancing the flamenco and so on with swans doing the samba, turkeys doing the twist. I learnt about few new dances through this book: Zapateado, Watusi, Nutbush and promptly looked them up to share with Ana. I am sure there are many more such treasures. I remember Look-Alikes Around the World by Joan Steiner and similar books a while back that we liked, which presented creative images with hidden objects to find. Books like these seem to have a universal appeal, regardless of age. Lovely post Sheela! They all sound fun really. Will look out for them. Great to know.. thanks, Lavs. We don't get too many comments on the blog. It's a priceless feeling when we actually do! Thanks for stopping by to share the good news! Pops - thank you for all the limelight ST has been getting! 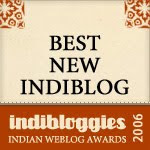 So thoughtful of Asha to have mentioned the blog in the interview. We should write to her thanking! I think you should not get disheartned by less comments. See the no of hits the site gets. Its very difficult to comment on each and every post. I have said this time and again that you guys are doing an awesome job and I am sure there are plenty others feeling the same.I have already visualised my son searching this site for book recommendations when he becomes a father.This seedling that you all have planted will grow and nuture many generations to come.